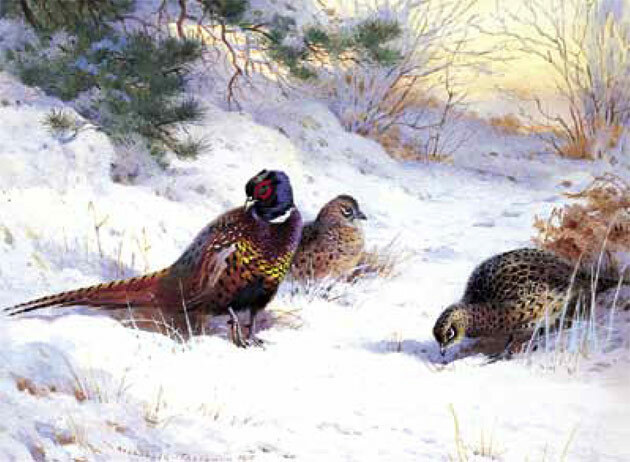 This beautiful painting of the common pheasant was painted by Scottish artist and bird illustrator Archibald Thorburn (1860-1935) who painted mostly in watercolour. Archibald was the fifth son of Robert Thorburn, portrait miniaturist to Queen Victoria. Archibald's paintings were regularly exhibited at the Royal Academy at Piccadilly, London and he designed their first Christmas card, for the Royal Society for the Protection of Birds in 1899, a practice that he continued until 1935. So it seems fitting that his images continue to appear on Christmas cards today. A high gloss Christmas card. By purchasing the The First Fall of Winter Christmas card 10p for each card you purchase will be Donated to the Charity of your choice from the Charities listed below.